When does an artist's journey begin? With the first mud pie made? Or at 15 as a Jantzen model? How does it continue at 46? insistence of NOT looking at the camera. Tee hee." 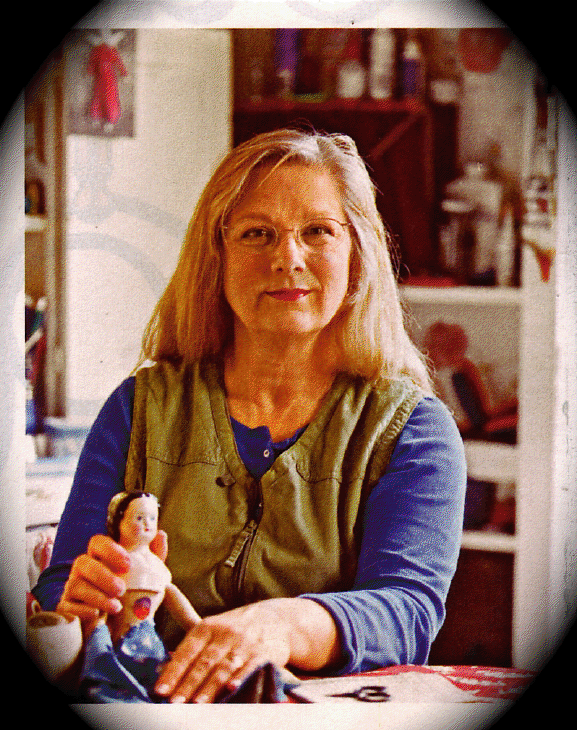 Our next interview features Christine LeFever, a folk artist and doll maker of many years. How long have you been making dolls? Did you make another kind of art first? How long have you been selling them? My doll making actually began in the 1970’s when I designed and made dolls for my children. The designing part was so simple. I just made cookie cutter styled dolls and that was that. Super Man was a trip in that style! I did make very long legs and arms for him. The best female doll, named Clara, whom I made for my daughter, disappeared down through the years. I tried to remember her and so made a new one, which I eventually sold. In 1977, I also made a soft sculpting of a nursery rhyme character “There was an old woman lived under a hill, and if she’s not gone, she lives there still.” For years we just called her “The Grandma Doll”, and eventually I sold her. She was about three feet long, and was permanently sitting in a small chair. 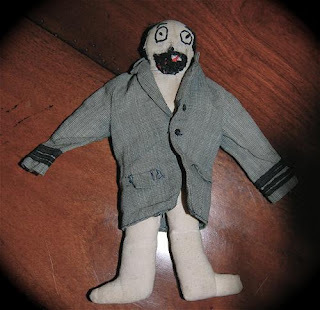 And for my daughter I made a funny little man doll named Frank that we still have here. In the early 1980’s I discovered Judy Tasch dolls. Judy is from San Antonio. I bought a book that told about her doll making, and of course, I can’t find that book anymore. 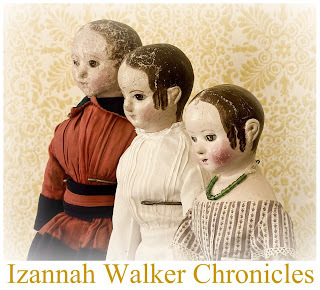 But she was one of the first that I knew of who was emulating the Izannah Walker styled dolls. I didn’t know that until I finally learned about Izannah, and then recalled Judy and knew that must have been the doll she was striving to make. I was hypnotized by her dolls and therefore Izannah’s dolls. My Izannah - This one is a two part bust, stuffed all cloth doll, with the two pieces hand stitched together. I did take Dixie’s class, and made a sculpted head, but I am so not yet a sculptor, so I have basically given up ever trying to truly copy Izannah’s faces. I also prefer that they be made of cloth entirely as were Izannah’s. The look is not the most important thing to me. The style is what I love. And again, if it’s a hard-sculpted head, or one poured from a substance that makes for a hard head, I cannot get thrilled. 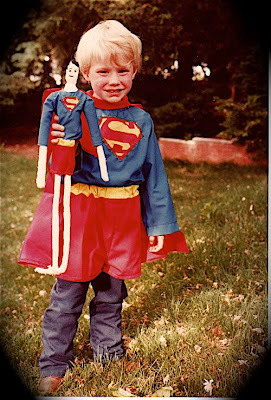 It wasn’t until the early 1990’s that I made a few dolls for sale. 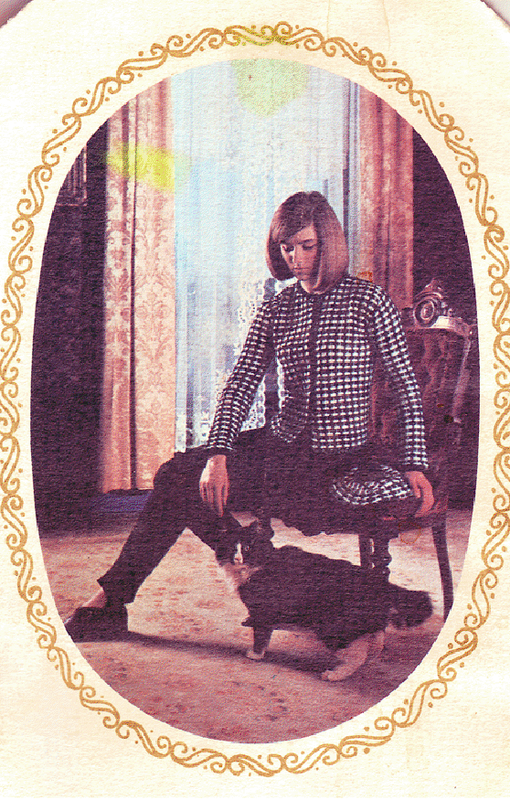 I discovered Gail Wilson’s darling cloth designs in a quilt shop and that did it. I made and sold some of those, giving credit, of course, to Gail as the designer. Later I met a number of women making dolls and that inspired me to make them myself. 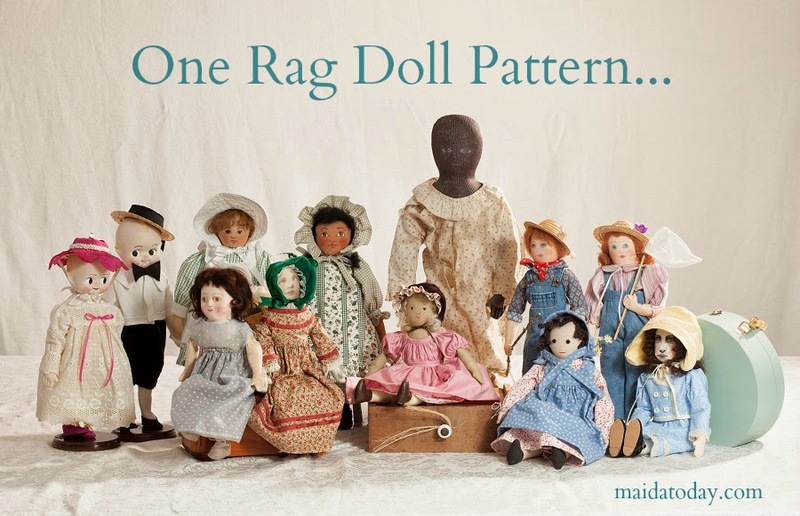 At first I just made the dolls from patterns of others, like Nicol Sayre, Christine Crocker, Sharon Andrews, Marcie LaJoie, and a few others, giving credit for the pattern maker. But I only made one or so of their designs. I knew I needed to design my own if I were going to actually sell dolls. Later, as I began to design my own dolls, I was fortunate to get accepted into Dee Foust’s Holly Berry Hill catalog not long before she folded it up. I sold a couple of my hand carved peg-wooden doll that I named Prudence Jane Plum, and also on Holly Berry Hill I offered my pattern for my Oregon Trail Button Doll. Granted, I only ever got into a couple of those darling catalogs, but that was all it took for me to feel welcomed into the doll-making arena. Then there was theorem painting, which is using a series of stencils and oil paint onto velvet. There are watercolor theorems too. The theory in this is that no two designs may touch, and so the design of the stencil takes some thinking. Below are two of my theorems. These are not my designs. These are old designs from a book of old theorem designs. I’ve never bothered to frame the large one, because it looks great in a cupboard surrounded by treasures. The little heart pinkeep is one I’ve sold a few of. Primitive portraits filled up a few years, but alas, I had to put the portrait painting aside, because they were not big sellers out west, and that is where I featured them. 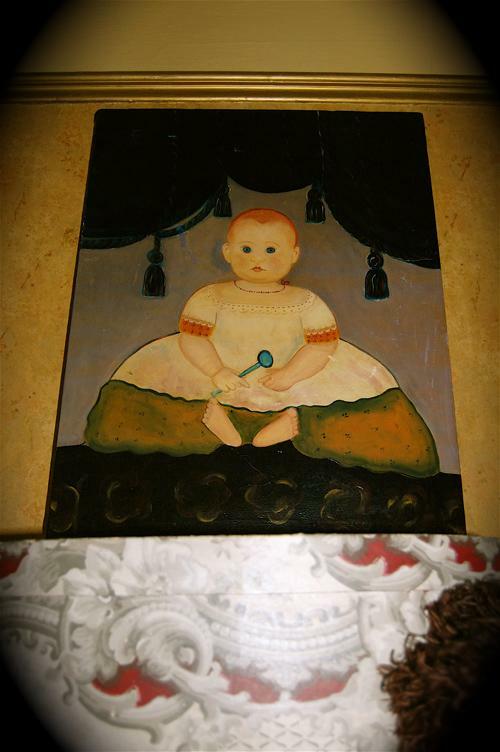 I have done primitive portraits of people’s children, but I detest doing that. I really only prefer copying the works of the past. 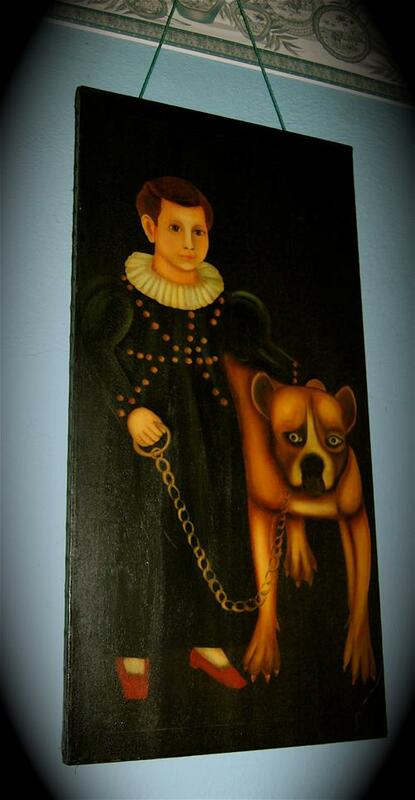 My large one here is a copy of Pierpont Edward Lacey and His Dog Gun, 1832 by Milton Hopkins. 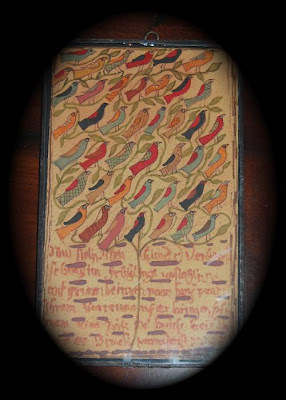 Originally it was believed that Noah North painted this, but in recent history it has been discovered that Noah North was Mr. Hopkins’ apprentice, and that Mr. Hopkins painted it. wherein the artist is unknown. 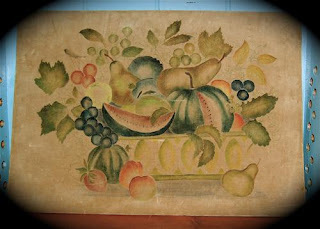 The original painting is from 1830-1840. I was invited to learn how to do chalkware, which is mixing plaster with water and pouring it into molds to become figures. The woman who invited me was the now renowned Stars Antique Mall, one-third owner, Gayle Tweed, (here in the Portland area) a friend who was in the same antiques club as I. 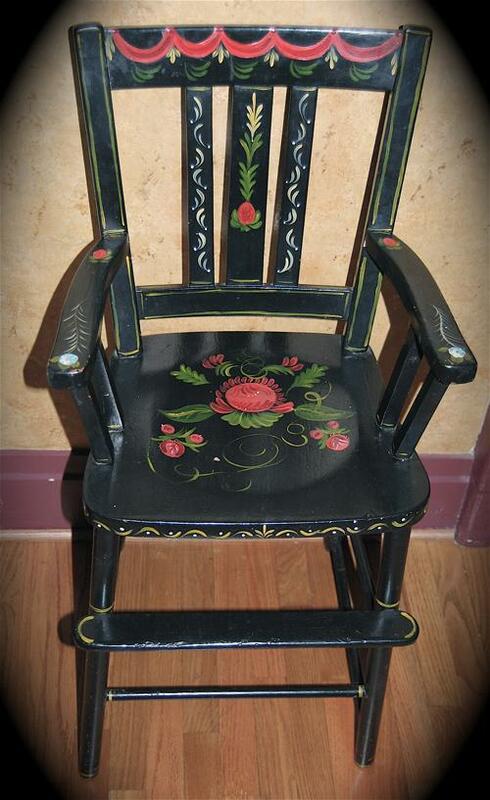 She wanted a chalkware artist for Mission Mill, which is a lovely historic venue in Salem, Oregon. That basically launched a wholesaling career that lasted a number of years. 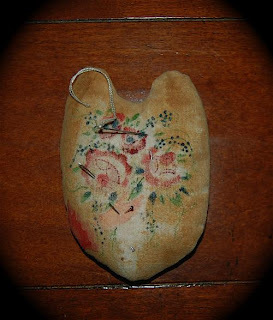 But pulling plaster out of molds became difficult on my wrists, and so, I turned to doll making where I could incorporate all of the decorative arts as tiny accessories for my dolls. I have always loved dolls. 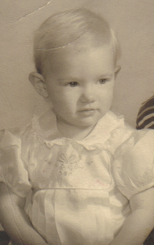 I am the third born of 8 children, four girls and four boys, and I am the only girl who loved dolls always. When I elected to “become” a doll maker, it was not to design my own dolls so much as to reproduce the dolls of the past. I merely buy old dolls and have a mold maker make my molds. I have made a few of my own molds though, for I finally took a class in mold making. I design the bodies and the clothing. 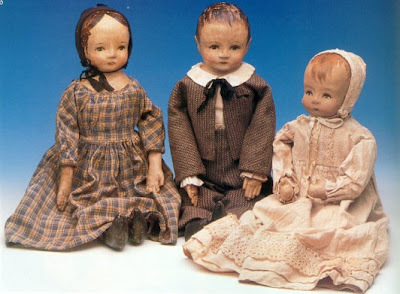 My love of the 19th century dolls is greatest in that they represent a solid, cozy home life to me. And my true purpose was to offer dolls as décor accents for the home. Obviously, décor to me is early Victorian, which began in 1837 with the birth of Queen Victoria. 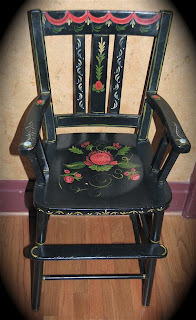 My favorite time in history from a décor angle is the early 1800’s in America and to some degree, England. Therefore, I do love a look that was popular prior to 1837. I never wanted my dolls to be as high priced as old dolls. 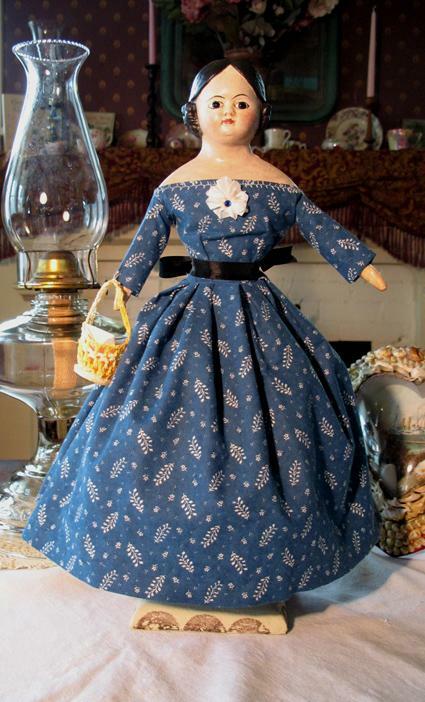 I simply enjoy creating dolls that reflect my décor era at a reasonable price to all, and I do offer layaway. I sold a few cloth dolls in the 1980’s and ‘90’s, and really cannot even remember the first one. 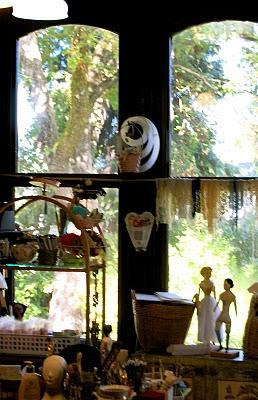 In 2002, my husband and I moved to southern, Ohio and that was where I launched my doll making “career”. We got my website up and going and then placed ads in Early American Life magazine, Mary Engelbreit’s Home Companion and a few others. 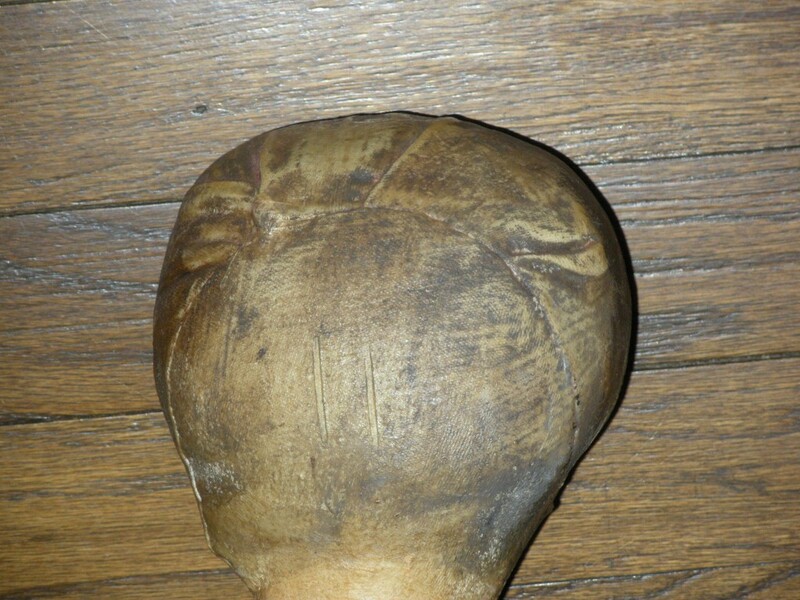 My first doll at this juncture was a maché head Greiner. 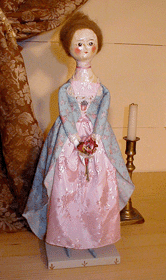 See Christine's website for description of Greiner dolls. Simultaneously I also created my maché head and limbs and cloth-bodied milliner’s model based on an old one that I own whose limbs are of wood. The following are my first available dolls: My antique Greiner that I named Hannah, AnnaBeth, my “carton” doll, and Emma, my milliner’s model. Describe your creative process - do you make detailed plans before you create the doll? What do you use for inspiration - antique photos, your own sketches, etc? Does the doll end up looking exactly as you planned or does it change and develop during the process? 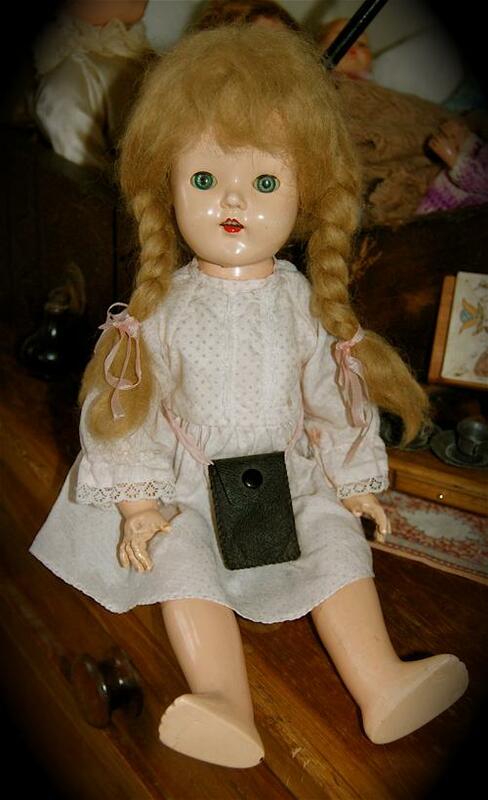 Only old dolls have inspired me, and therefore, again, I buy an old doll and have a mold made of her. 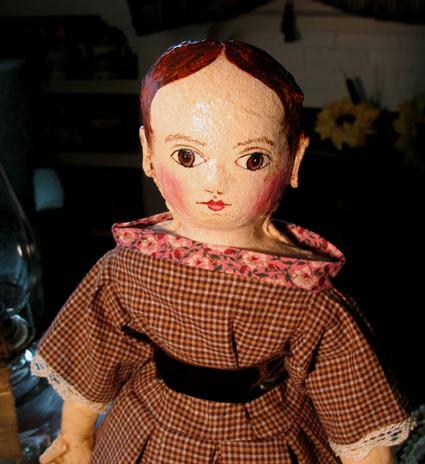 If I were designing a doll, which I do from time-to-time, I look at books of old dolls and do my best with those. Mine have never turned out exactly like the old dolls, but I’ve been happy with them. I have also designed an occasional doll from a primitive portrait. The pre-Greiner, doll’s doll that I call Maggie is my very favorite. She not only is, but also looks perfectly early to mid 1800’s to me. I love her face. She is the perfect little doll for sitting into a cupboard or onto a chair or bed. She simply looks perfectly old-fashioned according to my take on old-fashioned. I love that the original doll has the black, pupiless glass eyes, and that the mold produces this effect. There is something noncommittal about the black eyes. 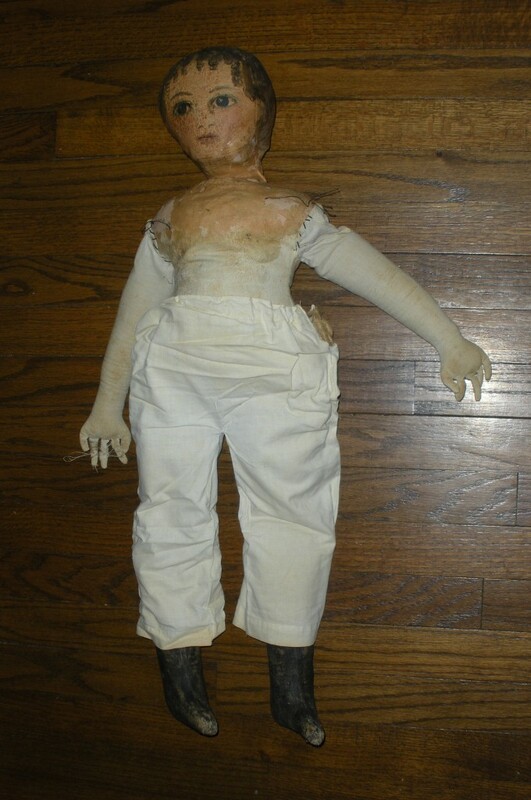 The doll seems like one that a child would have loved very much. She is a 16-inch doll. Below is a picture of “Maggie”. Perhaps the greatest change is simply that I know better than ever what appeals to me hence in being true to that, I need not strive to emulate competitors. Fads occur and many people scurry for the latest bandwagon. 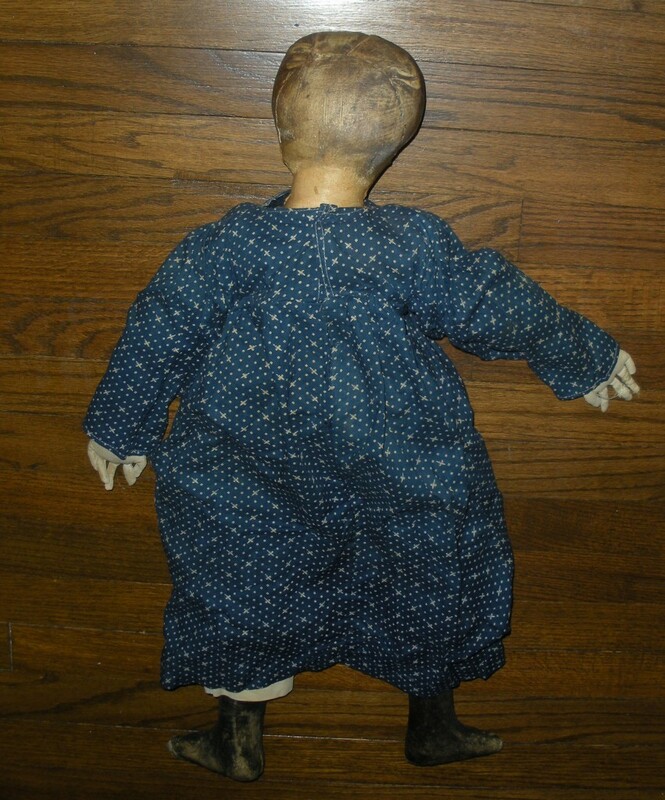 A very challenging change is that I do not feel compelled to purchase any more antique dolls to reproduce. I am now happily practicing my sculpting and hope the next primitive portrait doll that I create will be entirely sculpted by me. 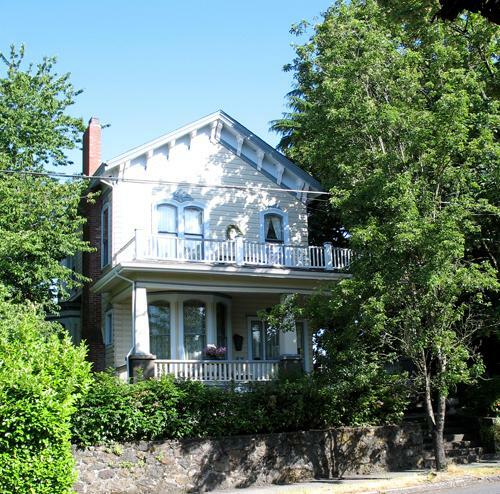 My husband and I live in a Victorian, Italianate house in historic, Oregon City, Oregon. One of the upstairs bedrooms is my “art room”. I don’t care to call a bedroom a studio. It is here where I do my creating. We do have a basement and that is where I do my pouring. Were you a doll person as a child? Do you remember making any dolls as a child? What was your favorite doll as a child? I loved dolls more than anything as a child, but I never got into a toy store. Mother was far too intelligent to take her children into such an arena. Whatever dolls she procured for me, I loved. 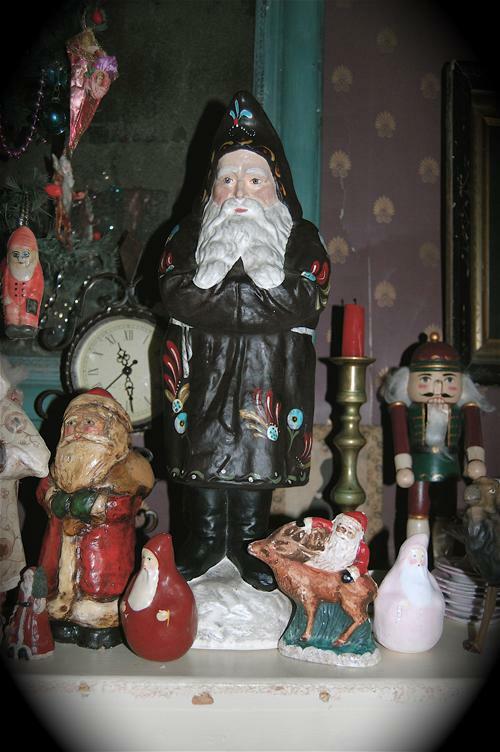 My favorite is my Christmas present when I was seven years old in Yakima, Washington back in 1954. Our relatives had come to our home, down from Spokane, Washington. There were my grandparents, aunts, uncles and many cousins. My doll was the very last gift given out that Christmas morning, because Mother had not wrapped it. It was in a light green shoebox way back under the tree, hidden by the sheet that she used for the “snow”. I spotted it later in the day and took it to her and asked what it was. She was very surprised and said, “Oh my, this is for you Christine!” I was beyond elated when I opened that box and there was my beautiful, composition, Madame Alexander, walking doll with blond braids and a beautiful face. I still have Robin. I always thought Santa’s helpers simply didn’t have time to gift wrap Robin. I made clothing for Robin in the most basic of ways, but it always worked just fine for me. 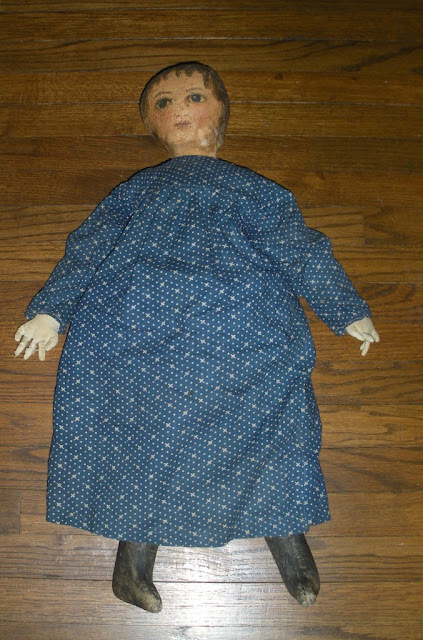 Picture a broad strip of fabric folded over, a hole cut for the head, and a rubber band, a ribbon or a string to tie around the doll’s waist. Instant make-do dress! Growing up in Yakima, Washington afforded my dear friend and I the joy of being able to traverse the orchards that surrounded our lovely, suburban neighborhood. We rode our bikes to these neighboring orchards, and took our dolls with us. 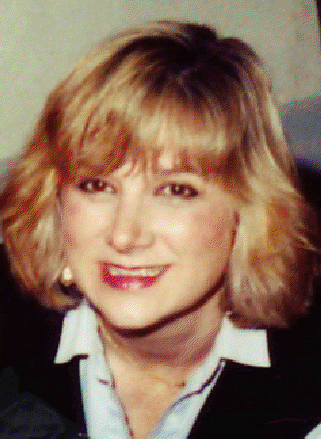 My friend & I, one, Barbara Quackenbush, of whom I have lost contact since 1959, when we moved to Portland, Oregon, were together so much, riding bikes to the lovely Franklin public swimming pool, or just walking through the countryside to Jack’s, a corner store where we bought little bags of penny candy. My mother would frequently ask why I didn’t just move in with Barbara. I honestly cannot think of anything I liked better than playing dolls. Elizabeth, another doll from the mid-1800’s, and at this writing not even yet introduced. Jane – A reproduction of a reproduction to where after I made the mold myself, she disintegrated. 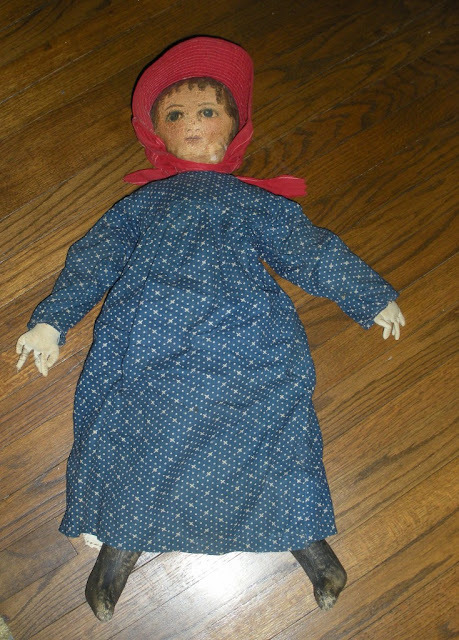 This doll is possibly an early twentieth century one that was created to resemble dolls of the mid 1800’s. The one I copied was made of hollowed chalkware. She has not yet even received her body and she is therefore also still not yet introduced. All the other dolls that I reproduce are either designed by me or in the case of Tillie, my mold maker, at my behest. His name is Miles Armstrong and he lives and works in Vancouver, WA. 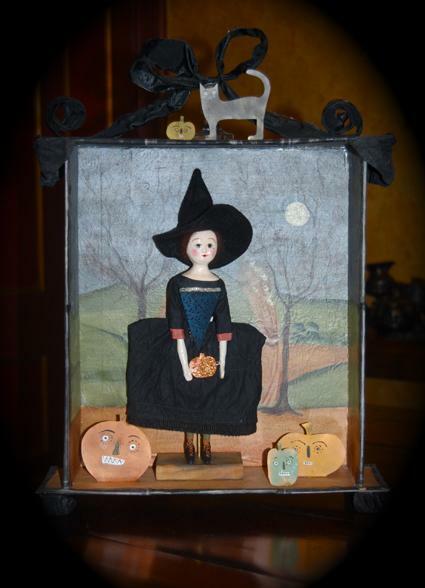 Visit Christine's website to see more of her reproduction dolls. I guess one could say I want to do it all and that I am not focused, and that I have ADD for artists. Hello! So many of us seem to suffer from this joy of non-stop creating. I even like to cook and clean house. Again, my house is the most important aspect. Also I am a house stalker. 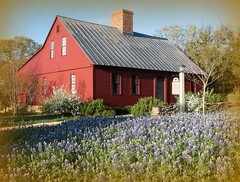 I love houses that reflect the earlier times. Living in Oregon I am not able to see much of any truly early houses, so I accept and enjoy the Victorian styles. I prefer living in an old house. But my very favorite type of house is that of the late, great, Tasha Tudor. And I do love that her son built it for her and made it to seem old. I love mansions too! My house is a cottage, but it feels like a mansion because of the beautiful high ceilings, and the elegant entry hall and staircase. I strive to keep a mix of primitive and some grand things here. I would never want to live in a house, no matter how grand, with maids or servants. I am domestic to the core and prefer to do all of my own care taking of my home. The idea of hiring my house to be cleaned is out of the question. 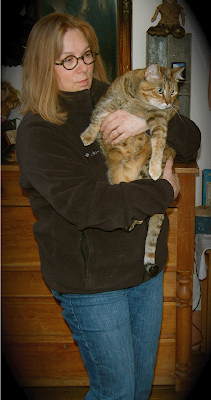 Again, Tasha Tudor, my favorite role model did it all, and that is what I admire most about her. This picture is one that I copied from a Currier & Ives called The Little Sisters. I did mine with a touch of mixed-media. It is about a 9 x12, that I have also scanned, reduced and put into the soldered frames. The doll above is my little “Bella In Her Environ”. I so love creating the box and then painting a scene. 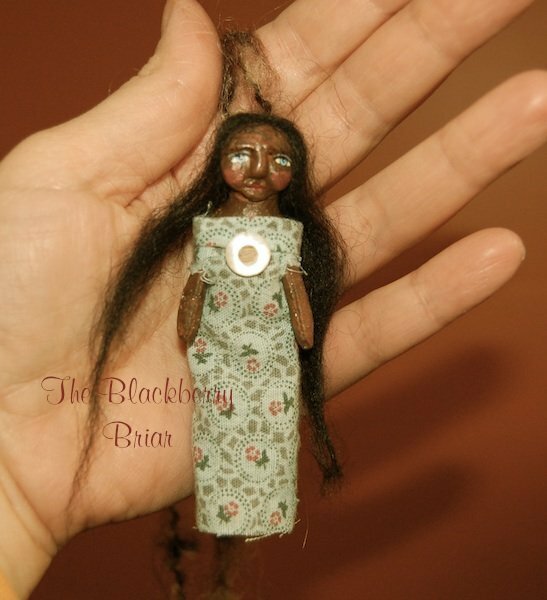 I have made a few of the Bella dolls in environs. My Tess dolls are my Queen Anne’s of poured, liquid maché. 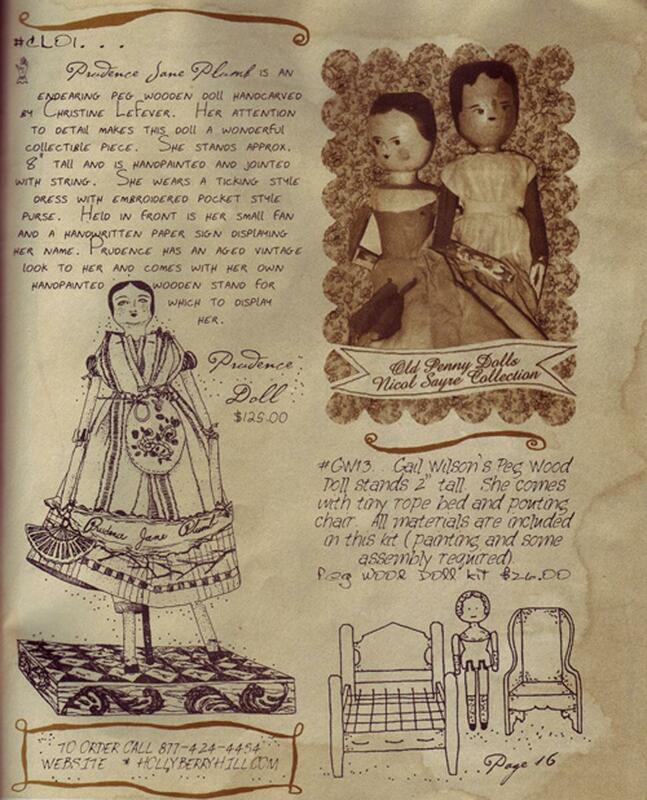 They are very simple dolls, and Warner Brothers bought two of them for the movie Felicity. They are seen in the film’s Williamsburg store sitting in the background as the two little actresses are chatting to one another. 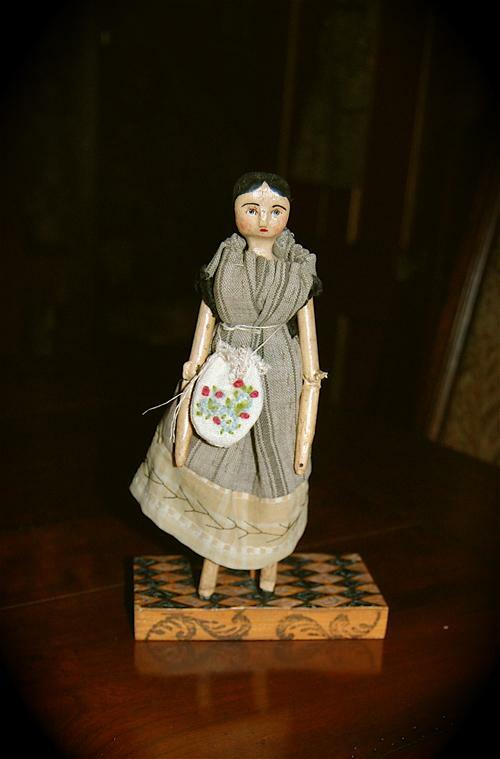 Is there anything you'd like to share about your making antique inspired dolls that we haven't covered? Perhaps the only thing I can think of is that as I’ve grown tired of crackling my dolls to give them an aged look, I feel as though I’ve fallen upon an interesting aging tip in that I like to use Tim Holtz Distress Ink by Ranger. I have noticed that my old maché head dolls aren’t all cracked at all, but rather yellowed. The Distress Ink in yellow is a wonderful thing to sponge over their faces, and not too much. I also use the color of the Distress Ink’s Tea Dye. Also, after I paint on shoes, I love to first spray varnish the shoes, then when dry, use the crackling mediums, and to antique over these cracks, and finally to spray varnish again. This gives the shoe the feel of leather! It is how I earn income. If I did not feel compelled to earn any money, perhaps I would no longer make dolls. But I know I would always do something creative. How does inspiration work for you? Sketches, seeing an antique doll that inspires, movies, people? Décor is my only consideration. I see an old doll that might fit nicely into an old-fashioned looking house and that is what drives me. I do not own too many dolls, because huge collections are not attractive to me. I don’t like too much of anything. I simply like an old-fashioned looking home. For this reason, no television is in my downstairs, and the one that we do have, although a nice fairly state-of-the-art style, is not huge and is kept in my art room where my husband and I relax in the evenings viewing what we enjoy, which is mostly history and movies that depict history. We don’t buy comfortable couches, etc., because that wouldn’t fit into our preferred décor. My sofa is an 1870’s, Renaissance Revival beauty. Always décor. As long as the house seems truly old in its presentation, I’m happy. I hope one day for my kitchen stove to be just like Tasha Tudor’s, but alas, it will have to be electric, because we cannot get gas in our house due to the heavy basalt foundation upon which the house was built. And wood cooking stoves are simply not allowed anymore due to environmental concerns. Of course, I’ve never bothered with a wood cooking stove anyway, but I have a friend whose wood cooking stove was converted to half gas, and it is remarkable. But the stove can wait until we restore our Victorian kitchen to what it was in the first place. Someone went wild in the 1960’s, and so, I have a very nice pink kitchen counter. But it is still old-fashioned looking in my kitchen in that I do NOT and WOULD NOT allow for an island! I have a lovely table and chairs in the center of my kitchen, and that’s the way I like it. 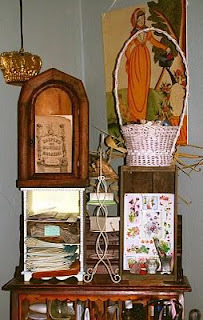 Kathy Patterson (http://www.babesfromthewoods.com/) is a magician with her Queen Anne woodens. Hers are my favorite ones being created because they look authentically old. Of course, her Izannah’s are beautiful reproductions too. Pam Haber of Ghost Island Primitives (http://www.picturetrail.com/ghostislandprimitives) is my favorite maker of early looking cloth dolls. 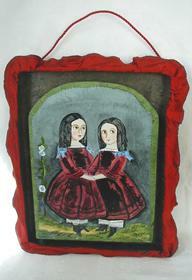 Jennifer and Norma Schneeman are two very wonderful doll makers in that their hand stitching is impeccable. 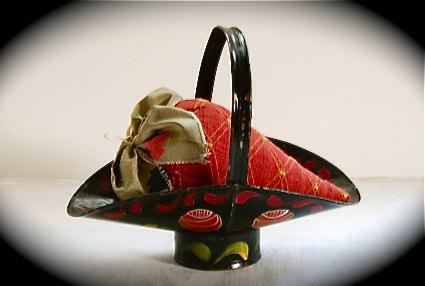 They occasionally use old fabrics, but if they do not, they age the new perfectly. 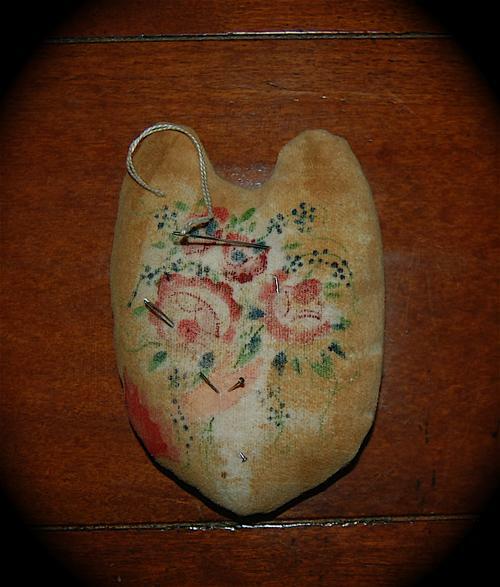 Ultimately my very favorite is the worn and aged cloth doll. 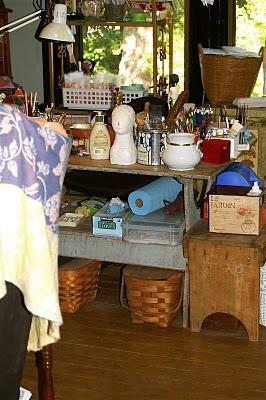 I truly love the primitive look that is simple and homey. People who artistically made-do are my favorites for their ingenuity. Favorite quote or quotes? I have many of them, but they don’t pertain to doll making. and for poise, walk with knowledge that you are never alone." I will be the gladdest thing under the sun.
" Those who do not want to imitate anything, produce nothing." "What is your preference, a look or an actual old doll?" I tend to prefer dolls made by artists that can make the doll look old. 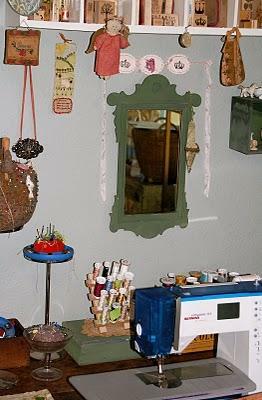 I do not require old fabric, but I admit, a little of it helps and adds. I admire artists who can do the faux thing. In fact, I am thoroughly impressed with faux decorating. I am drawn to Trompe l’ oeil art. Fool the eye. When you make an artwork, do you have in mind the receiver of the work (i.e. collector) or do you ignore that someone down the road will be buying your work? Does this influence a piece of work for you? I only make what I want to make. I seldom take a special order. That doesn’t mean to say that I’m completely against it, but it doesn’t appeal to me. If I were creating a doll with someone’s idea in mind, then it wouldn’t really be mine, you see. Please visit Christine's website for more information about her process and available works. "I have been yearning for a black rag doll. Since I can't drive anywhere, and even though I watch the sky in case one should happen to falll in my yard , but no luck so far. f my nerves weren 't so frazzled I could make one as a last resort. There's no need to blow my blood pressure our the roof over it. . I'm fast getting bey;ond beyond being able to think or see what 'm doling (I yhinkF) so I might as well go on to bed. I still want a black rag doll, period. I'm getting old, fast and I don't need any more reason!!!!! !11So there." Another smaller group shot above. My own Dixie dollie in red above is still in progress, and will wait for Susie McMahon's doll (below)to arrive from Australia as a traveling companion. Susie McMahon Thank you to everyone who participated!